A woman requested for the fried kway teow that she ordered from a restaurant to be "extra spicy", and alleged finding "over 80" chopped pieces of chilli padi in the dish when she got it. 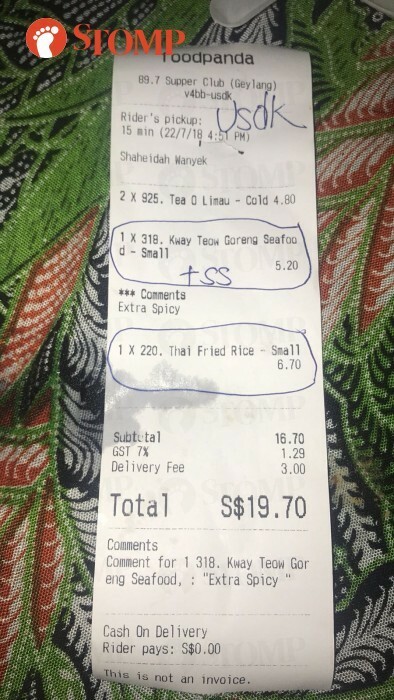 Stomper Sha said she ordered the $5.20 seafood kway teow goreng for herself and a $6.70 Thai fried rice for her husband from 89.7 Supper Club on July 22. The dinner order was made via Foodpanda's mobile app. Sha said: "I asked for 'extra spicy' but did not expect over 80 chilli padi in my char kway teow. "I didn't really notice it as first as we were watching a movie while eating. However, by the third mouthful, I felt a burning sensation in my mouth and throat. "I stopped eating and picked out about 20 to 30 pieces of chilli padi. Sha then tried to continue her meal, but ended up discarding it. "I found that there was even more chilli padi and my mouth was still burning. In the end, I threw the kway teow away even though there was still more than half left. "My husband's fried rice was perfectly normal." According to Sha, she orders food from the restaurant twice to thrice a week, but never had such an experience before. "Sometimes, about once a month, I would ask for my food to be extra spicy to satisfy my cravings. There's usually 20 to 30 pieces of chilli padi. But this time, there were over 80." Sha told Stomp that she subsequently posted about the incident on her Facebook account as well as messaged 89.7 Supper Club on their page. She also informed Foodpanda of the incident and said they gave her $5.20 in credit for her next order. This amount is the same as the cost of the dish. The Stomper added: "I called the restaurant's Geylang East branch where my food was delivered from. They referred me to the manager at their head office in Changi Village. "I tried calling the manager over the next few days but could not reach him as he was not in the office each time. "He seemed agitated and I ended the phone call afterwards. "During the call, he did not apologise nor resolve the issue." Stomp got in touch with the said manager, who declined to be named. He confirmed that he was aware of the incident. He told Stomp in a phone interview: "When a customers asks for their food to be more spicy, our practice is to add more chilli padi to it. "What happened was this customer (Sha) found that we overdid it. "I told my staff to tell her that in this case, bring her Foodpanda receipt to any of our outlets for a refund or a replacement. She refused. "When I spoke to her yesterday, I asked her what she wanted, which she took issue with. "She kept saying that she wanted to make a police report, so I told her, by all means. She also said she was going to inform the National Environment Agency (NEA)." The manager maintained that he meant it in a "polite way" when he asked Sha what she wanted, since she had allegedly turned down his offer of a replacement and a refund. However, he admitted: "I found her arrogant so I didn't feel like apologising. Asked several times by Stomp if the incident was accidental, the manager reiterated: "Just take it as a mistake." He added: "The woman even said she was a regular. Therefore, I don't understand why she is making noise because if she's a regular customer, then she should understand our style. "If she can take out the chilli padi, that means she can still eat the food. After all, it's not like chilli sauce." The manager, who said he had consulted a lawyer over the incident, asked for people to understand his predicament. 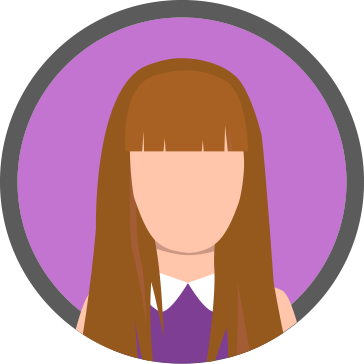 "I already offered her a refund and replacement. Following Stomp's conversation with the manager, we spoke to Sha again. Describing the manager as "cocky", the Stomper maintained that she had not been offered a refund or replacement. She also said she mentioned the police and NEA during her phone call with the manager. "I just want the restaurant to acknowledge the issue properly," said Sha, adding that she is "still contemplating" making a police report. "For all you know, it could have been an act of mischief. "What if some people who can't take the spiciness encounter the same thing and end up with a stomach ulcer? I sometimes order food for my grandmother and what if this happens to her? You know what it's like for old people." Sha also suggested letting customers indicate the level of spiciness they wanted in their orders to avoid such incidents in future.